A diary of musings, a travel log, and places of interest whilst crossing the Galaxy in an ASP Scout. Load-outs,preparations, and other stuff. My last view of the first way point. Two suns and a Gas Giant. This looks pretty dark, but the picture was actually taken on the bright side of the planet. The description of this body makes interesting reading. "Gas giant with ammonia based life. 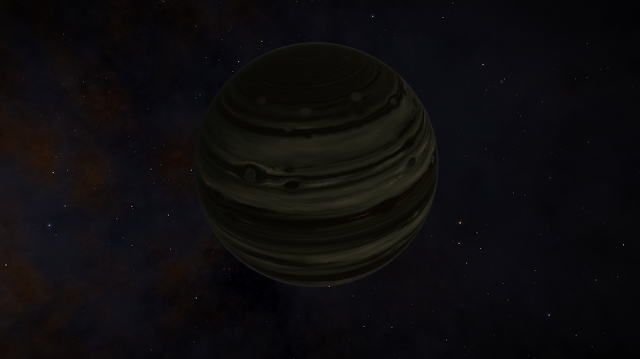 This is primarily a hydrogen and helium based atmospheric gas giant, but a little below the surface cloud layers, life exists based in the ammonia cloud layer. The chemistry of the region is far from equilibrium, with a surprising excess of oxygen and many carbon bases compounds giving it some vivid colours. As with many gaseous living systems, it is underpinned by vast quantities of free floating radioplankton - tiny carbon based algae, each retaining a small quantity of liquid ammonia, extracting their energy from the intense radiation flux." Despite what the description says, the colours are not that vivid, but an interesting body to say the least. A nice view to remember this first way point. Now I am wondering what to do. I landed on a planet where I thought I cold get some more Polonium. This planet only had about 1.5G, but seemed to be all fingers and thumbs when landing. I think I had my throttle pretty much full up, and was concentrating on the ground radar to locate a suitable landing spot when the ship tripped up and almost did a complete somersault. Now I am in 2 minds of what to do. The hull is not a module that can be repaired by the usual methods, so I am now considering jumping back to get a full repair and coming back out again. After a lot of thinking, I have decided to head back to civilisation and makes some repairs. Sadly, there is no way that I can repair the hull in any way, (apart from at a station), so rather than go any further on and loose everything I have gained so far, I'll go back, and then return back to here and carry on. It will be a bit precarious, so watch this space !! I submitted, put 4 pips into the engines and kept boosting away. 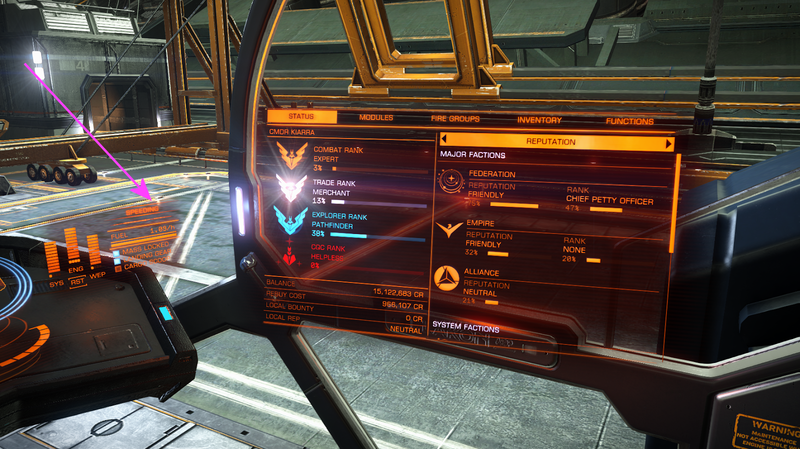 He took my shields down 1 ring, but they soon recharged and I was back into cruise. Docked at the station, repaired and sold my exploration data. 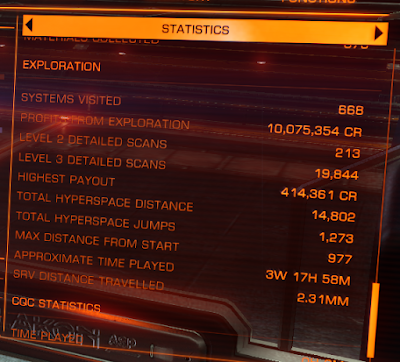 The highest bonus for a single planet was 24k and I think I made around 1.5m in the end, so not too shabby. Interesting whilst docked at the station and checking some stats, I discovered that while standing still, I was speeding!!!!!! Now I just need to pop back to where I was. Valuable lessons learnt! Day 3 - Fuel concerns add to change of route. Original Route with some basic data. (c) Andrea Richards. Simple theme. Powered by Blogger.